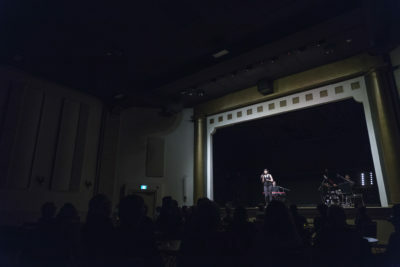 Calgary jazz/soul singer Ellen Doty performed her latest album Come Fall at the Rex Hall last Friday as part of her 18-show cross-Canada tour. Her latest album Come Fall has garnered noteworthy attention, debuting at number one on iTunes in the jazz category along with receiving outstanding reviews from fans and media. “I’m excited about the new album, it’s great to be able to share it with people and to perform the music live,” she said. Doty takes much of her inspiration from the timeless records of Ella Fitzgerald, Frank Sinatra and Billy Holiday to emulate the classic sound in her music. This vintage style was much more pronounced in her first feature album Gold, which also received numerous acclaim. After her previous success, Doty decided to take a new approach with her latest album. Doty began singing at the early age of four, with much of her vocal training coached by her mother and introduced to many soul and R&B standards. “My mom was a choir director, so she had me singing when I was young, and my first performance was at my grade one talent show,” she said. “We had a book called Hits of the Seventies, so I used to sing lots of Marvin Gaye, Roberta Flack and Otis Redding. As an artist on the road, Doty shares some of struggles with balancing her personal life with her musical career. “It’s tough as I am away quite a lot, my friends and family are very understanding with me missing a lot of events, my boyfriend is also a touring musician, so you have to be with people who are understanding of that lifestyle,” she said. Regarding Ellen Doty’s plans for the future, she intends to continue touring in other parts of the world. “I’m doing jazz festivals this summer in Canada and I’m doing my first tour in Europe in October,” she said. There is no doubt that Ellen Doty is a one-to-watch artist for the next few years to come.